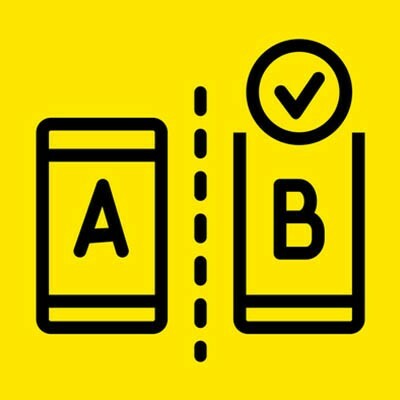 Running an A/B test is the process of comparing a single variable to deem which option, Option A or Option B, is the more effective of the two. The key to an effective A/B test is to only change one thing between the two test subjects - otherwise, you have no way of knowing exactly what it was that was the influential change. A/B tests can be used to make a wide variety of choices, from something as simple as an adjustment to a call-to-action to a different layout to a particular page. In this case, Option A should be the way things currently are to serve as a control for the experiment, while Option B displays your proposed change. Each option is then presented to an equally-sized segment of your audience to deem which of the two is the more effective. A/B testing can be used to make a vast number of decisions, as long as they are approached one at a time. As we said before, if multiple variables are involved in a single test, that test isn’t going to deliver reliable enough results to make any well-supported decisions. It is also worth mentioning that A/B testing tends to work better when comparing options for relatively minor changes, like calls-to-action or images included in an email or on a landing page, rather than big ones. The first step will be to decide which variable you intend to test, followed by your determination of a metric to base your observations against. Does this change boost engagement? Increase the time spent on page? Improve your click-through rate? Once this has been accomplished, you’re ready to state what your control option will be, and what your change will be after that. Your control group should be whatever you currently have in place, so you can accurately judge if a change would be an improvement or not. Then you need to settle on a sample size, or the number of recipients that will be a part of this test. Not all changes will be accurately measured with a sample size alone. Some changes would be better left running until a statistically significant data sample has been collected. Speaking of statistical significance, you will also need to decide how significant your results have to be before a change is deemed to be worthwhile. There are two real keys to running a successful A/B test: first, you have to give it enough time to collect the data you’ll need to come to a conclusion, and second, both options need to be tested at the same time to prevent other variables from affecting your data. Of course, if the variable that your A/B test is evaluating is timing, this doesn’t apply so much. In short, A/B testing is a relatively simple way to make sure that you’re having as large an impact on your audience as possible. Can you think of any times that you’ve done something similar to test out a proposed change? Tell us about it in the comments!